... it was the perfect atmosphere for finishing the ARC of Sapphique by Catherine Fisher (Dial, pub date: December 28, 2010 -- tomorrow! -- and fine for ages 12 and up). Wow! What an exciting read! Catherine Fisher does an excellent job of world-building. This is the kind of futuristic fantasy novel that makes me despair of ever being able to write well. Several storylines interweave to create a richly-textured narrative that makes us question everything. First, we see Attia and Keiro, still trapped within the dark, chaotic world of the living prison that is Incarceron. They'll do anything to find a way Out. They meet an eccentric magician named Rix who claims to have the glove of Sapphique, the legendary prisoner who Escaped long ago. Next, Claudia tries to prepare Finn for his coronation as Prince Giles. But is he the true Prince Giles? Why can't he remember more of his past? How will he prove he's the real prince when a Pretender, supported by the Queen, appears and claims the title for himself? Finally, Jared, Claudia's tutor and a Sapient, who is struggling with his own illness, attempts to find a way to fix the portal, damaged by the Warden when he disappeared into Incarceron. Jared thinks he may have an answer to all their problems, especially when a disaster occurs in the Realm. The living prison of Incarceron is, of course, amazing, especially when it begins to search for a way to escape itself, but what I find most fascinating about Fisher's world is the Realm, a vaguely-18th-century world where since the Years of Rage, nearly everyone observes Protocol, wearing long gowns or breeches and powdered wigs, riding in horse-drawn wagons, and ignoring the techno-gadgetry behind it all. Kind of a Williamsburg gone mad. Do you think people would ever be willing to go back -- or pretend to go back -- to a simpler time? If you've never read Incarceron, you definitely should start there. 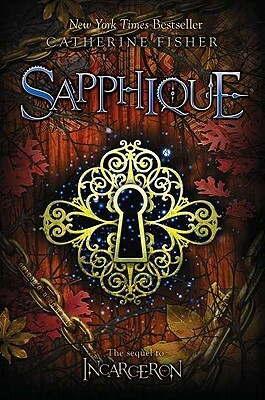 If you've already read the first book, grab a copy of Sapphique and enjoy the sophisticated plot and the fine writing. On a side note, a movie is being made of Incarceron, supposedly with Taylor Lautner as Finn. I refused to picture him when I read Sapphique, because I already had a firm image in my mind from reading the earlier novel, and that image wasn't of any particular film actor. Do you picture movie stars when you're reading a book? Or does your mind create an original image? Hope these make you smile. To those who celebrate Christmas, have a wonderful holiday! *According to Wikipedia, "a flash mob is a large group of people who assemble suddenly in a public place, perform an unusual and pointless act for a brief time, then disperse." What do you think? Are flash mobs entertaining or annoying? Are they the next social revolution? And can the above examples even be called flash mobs or are they simply performance art? Police in Philadelphia have had trouble with flash mobs that turned violent. Should we come up with a different name for the musical performances that have entertainment value and are not the least bit dangerous? Is there a book idea in there somewhere? Questions to ponder after Christmas. I'll be spending the next few days enjoying my family. 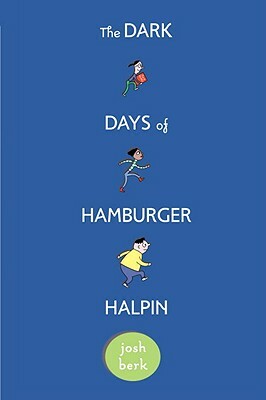 The Dark Days of Hamburger Halpin, by Josh Berk (Feb 2010, Knopf, ages 12 and up). Will Halpin is the new kid in school. 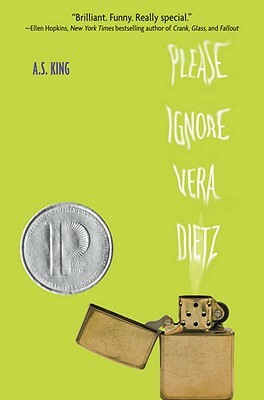 Okay, so what sets this book aside from other high school books about the new kid? Well, to start with, Will's overweight. And then there's the fact that he's deaf. Will transfers from his all-deaf high school to a mainstream Pennsylvania high school because he feels he no longer fits in at his old school. Carbon High can't afford to hire an interpreter, but Will can read lips really well, so the teachers are supposed to seat him where he can see them and the faces of his classmates. Sitting in the corner isn't exactly helping his chances at popularity. Most kids snub him. Some of the teachers, like the hot Miss Prefontaine, make fun of him. Devon Smiley is the only kid who talks to him, and Devon's low on the food chain himself. Lip-reading, especially on the school bus, turns out to be an amazing way to learn about your fellow students. And Will quickly realizes that popular jock Pat Chamberlain is having a party and using a deck of playing cards to invite his friends. It's also easy for Will to figure out who the cool kids are, including Leigha Pennington, Purple Phimmul, Derrick Jonker, and A.J. Fischel. In history class, Will discovers there was a famous deaf coal miner, also named Will Halpin. Was he a relative? Why have Will's parents kept him in the dark? The class goes on a field trip to a coal mine and a popular student falls to his death. Will realizes there are a lot of suspects. The police interview everyone, including Will and Devon, but can't seem to solve the murder. Can Will and Devon team up to figure out who the killer is? Or will the wrong person get arrested? The mystery of the deaf coal miner adds an interesting layer to Will's search for himself. And the murder mystery ratchets the story up another notch, making it a real page-turner. Yet even if this book were just about Will trying to fit in to a new school it would be worth the price, because Will seems like a real kid, smart, sarcastic and with a great sense of self-deprecating humor ("...a guy with the body of a sedentary manatee."). He's also sharply observant of his fellow students and comes up with appropriate nicknames for them all. Even if it's been a while since you were in high school, you'll recognize the students, the teachers, and even the bus driver (Jimmy Porkrinds is hilarious!). To learn more about Josh Berk, visit his website and also be sure to check out Donna Gambale's recap over at The First Novels Club of the recent signing with Josh Berk and Amy King (author of Please Ignore Vera Dietz -- which I reviewed here). Thanks, Donna! Marvelous Middle Grade Monday -- Boom! Shannon Whitney Messenger started this awesome meme and I'm slipping in to recommend another marvelous middle grade book from May 2010 that you may have overlooked. BOOM! No, I'm not trying to startle you. 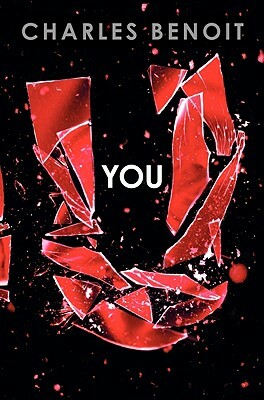 That's the name of the book. 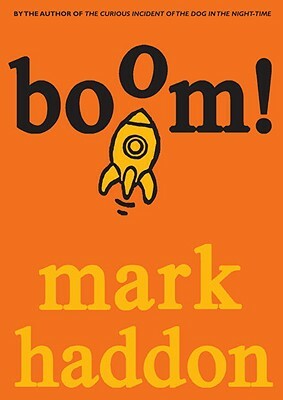 And you'll notice it's written by Mark Haddon, he of The Curious Incident of the Dog in the Night-time fame. Yep. Same Mark Haddon. Which means this book is very British. And I applaud Random House for NOT Americanizing it. Yay! I believe we should give kids some credit and let them figure out this stuff themselves. Okay, so a biro is a pen and plasters are Band-aids. (I lived in England for a year, so I know some Brit slang.) If kids don't know these and other terms, they can Google them or get it from context. Right? Kids ages 8 to 12 (and especially boys) should give this book a try because it's freaking hilarious. Jim and his best friend Charlie overhear two of their teachers speaking a strange foreign language after school. They say things like "Toller bandol venting," and "Loy garting dendle." It doesn't take Jim and Charlie very long to figure out their teachers are aliens. There are a lot of shenanigans involving food, policemen, motorcycles, Jim's sister Becky, her cretin of a boyfriend, and a certain loch in Scotland. The chapter titles alone are worth the price of the book. I won't spoil this for you by going any further. Just find a copy and read it. Chances are good I won't be posting a MMGM post for the next few weeks because I'm up to my eyeballs in Christmas preparations (still haven't done my cards -- AGH!) and of course, I'm exhausted from increased hours at work (this is a bookseller's busiest time of year). I'm also catching up on YA reading right now and *blushes* haven't read any new MG novels. I did, however, manage to finish revising my third draft of my own MG fantasy novel. And I'm now putting it on a back burner to simmer gently. For several months. Or a year. Hope it doesn't boil over. What about you? Are you accomplishing what you need to this December? And here's a different question: Do you think British kids' books should be Americanized, or not? This may become a regular feature on the blog because I have a lot of pet peeves about the publishing industry. Like why those cardboard display dumps never lock in properly and always end up falling over. And why pop-up books are the bane of a bookseller's existence. DO NOT MAKE GOOD HOLIDAY GIFTS! They may be fantastic reads. Look at The Replacement by Brenna Yovanoff, for instance, which is on my TBR pile and has gotten lots of good buzz. Or look at You by Charles Benoit. The latter blew me away. Talk about compelling. Reading You is like watching a car accident happen in slow motion. You're fascinated and you can't turn away. But does it make a good Christmas gift? Hell, no! Not to a sweet little old lady looking for something for her 14-year-old grandson. 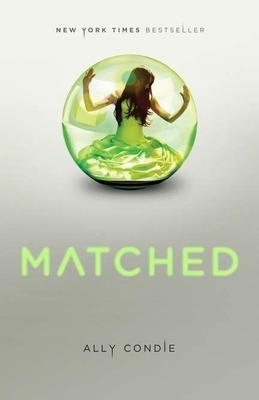 And Paranormalcy by Kiersten White is one of the funniest, sexiest (without being raunchy) YA novels I've read this year. I've tried to handsell it to plenty of people this month, to no avail. Why? 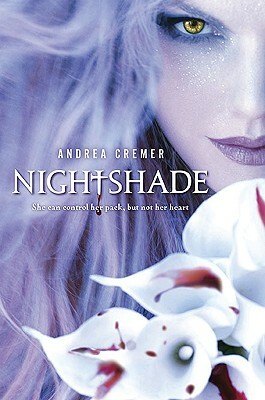 The cover makes it LOOK dark and scary. If it had a brighter, lighter cover (think of something Evie uses that's pink with rhinestones), I'd probably have sold dozens. Grandmas want something that looks sweet, like Gimme a Call by Sarah Mlynowski. And then I have a related problem. There's a wonderful, inspiring book called The Running Dream (which I reviewed here). It would make a great gift for any tween or teen girl. But it pubs in January. January! This is useless to me when I'm recommending Christmas or Hanukkah gifts for people. When will publishers start listening to booksellers, the people in the front lines? Humph. Okay, I'll get down off my soapbox now and stop acting like Scrooge. A hearty welcome to my new followers. I'm glad you're here. And I hope everyone has a wonderful Christmas, or Winter Solstice, or whatever you celebrate. The next two weeks will be my busiest at work, so I may not post as often (although I hope to be back on Monday with a hilarious MMGM recommendation). What about you? Anything in the publishing industry you want to rant about? The amazing Shannon Whitney Messenger started this meme and I wish I'd thought of it first bow to her genius. Hooray for Middle Grade!! Be sure to check out all the other MMGM posts today: one from Shannon O'Donnell, another from Myrna Foster and also from Elle Strauss. It's a veritable Middle Grade Love Fest! You do know that Middle Grade is the new YA, right? 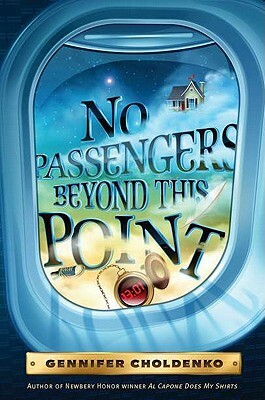 Add this one to your TBR list: NO PASSENGERS BEYOND THIS POINT by Gennifer Choldenko, coming in February 2011 from Dial Books for Young Readers. (Yes, she's the Newbery-winning author of Al Capone Does My Shirts.) Like a modern-day Wizard of Oz, this book will swoop in and carry you away. Buckle yourself in and hold tight! Twelve-year-old Finn has always been a worrier. As the only guy in his household, he feels responsible for his mother, his older sister India and his younger sister, Mouse (real name: Geneva). But when Mom tells them she's lost the house to foreclosure, and she's sending them to Colorado to stay with Uncle Red, Finn and his sisters have to work together to survive an even more urgent crisis. Because where the plane ends up definitely isn't Colorado. They know something's wrong when the plane lands early and they're met by a driver named Chuck. He drives a shocking pink taxi adorned with white feathers. Yes, you read that right. Feathers. Worse, Chuck has never heard of Uncle Red. No Passengers Beyond This Point is one strange trip indeed. The three siblings, who take turns telling the story, find themselves in a place called Falling Bird, where they are greeted by adoring crowds and each given a house of their own. After that, it's someone else's turn to be met and adored. The siblings are offered jobs if they want to stay in Falling Bird. And this is where the book really begins to get its talons into you. Should they stay? India certainly wants to. Can Finn and Mouse convince India they need to go home -- wherever home may be? This is one of those books that resonates long after you finish reading it. I read it a few weeks ago, and I'm STILL thinking about it. The ending may send chills up your spine. Even if you think you can guess what's going on here -- you'll probably be at least slightly wrong. Because things are not what they seem. Oh, good, you remembered to come back! Whew! And then there was Psst! Wanna hear a secret? 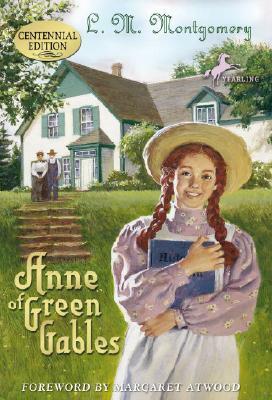 in which I confessed I'd never read Anne of Green Gables. Yep. I'm reading Anne right now. Well, not at this exact moment, no. Don't be silly. But this weekend. And, my, how times have changed. Lucy Maud Montgomery doesn't introduce her main character until PAGE 10! And just think about all that lovely description, the kind we're not supposed to write anymore. And the adverbs - oh my! But it works, because she tells a good story, with memorable characters. So, when I finish that, what should I read next? You'll notice the last 4 books on the list are MG. Next up should be a YA, don't ya think? Anna and the French Kiss by Stephanie Perkins? 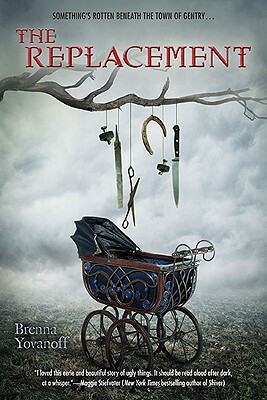 The Replacement by Brenna Yovanoff? And what's on your TBR list? Throughout the month of November, Tara Lazar hosted a wonderful event called PiBoIdMo. That's short for Picture Book Idea Month. I suppose Tara started this for those who prefer to think about picture books instead of novels during November when all those brave novel-writers are struggling through NaNoWriMo (although some people participated in both!). This was the first year I participated in PiBoIdMo (thanks to my writing group for the nudge) and I did it -- I came up with 30 (actually a few more) sparkly new ideas for picture books. Some of them are just titles, some have characters and a conflict already, some are variations on a theme. But it's enough to keep me busy for the next year (along with starting to write my second novel -- I'm a slow novel writer so NaNoWriMo isn't my cup of tea). What about you? Did you participate in either event? Did you complete your task? Would you try it again next year?